Like so many of us, I very much welcomed the addition of a Taiwanese milling machine to my workshop. This happy event occurred a few years ago and I must admit lots of happy milling hours were spent with it. More recently the machine park has been updated and the original mill/drill made room for another, bigger yet again Taiwanese, milling machine. One day, I was happily milling along when suddenly there was a big expensive bang. Due entirely to my own error (It takes time to learn Taiwanese !) the four tooth end mill I was using all of a sudden had only three remaining. To aggravate the situation it was Sunday and naturally the shops were all closed. While cursing my ill fortune over a cup of coffee and wondering how to overcome the problem, it occurred to me that I might have a try at regrinding the useless cutter. 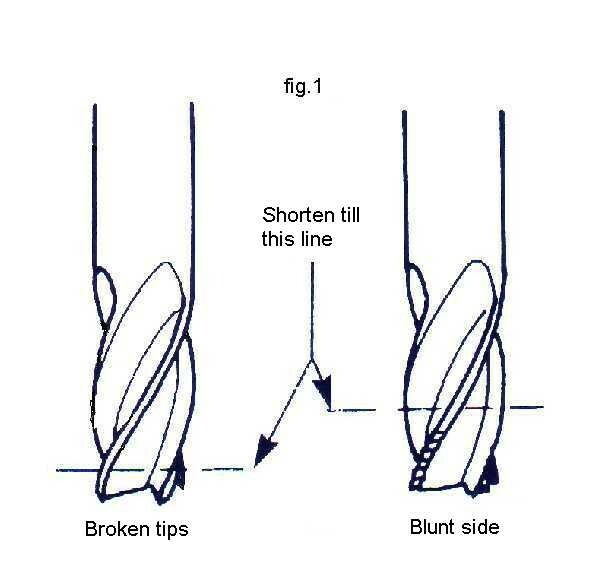 After all, so many of us manage to regrind our drills by hand, so why not give it a try. 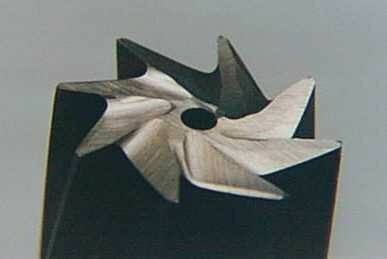 Learning from this ruined cutter, I evolved the following method for dealing with blunt or damaged end mills. I even found that the method could be extended to the larger multitooth cutters as well. A word of warning at this point. If you are a skilled tool and cutter grinder and own a machine like the Quorn or similar machine, turn away in horror, hit your mouse button and surf to another page. Other less equipped souls, like me, may find it a way out of trouble. The first step is to carefully examine the damage to the cutter and determine just how much, or little, must be removed from it. 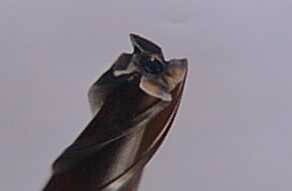 Photo 2 shows a worn out milling cutter with a broken lip and side damage. 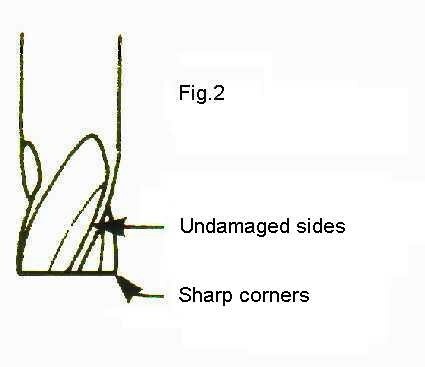 Figure 1 will show the damage more clearly. In both cases the cutter requires shortening to remove the damage. The aim of the first stage is to finish with a cutter as shown in Figure 2. The central cavity will probably disappear completely, but don't worry, it is restored in the next step. By grinding the mill as shown in Photo 5 we make room in the centre of the mill. The corner of the grinding wheel used for this operation is slightly rounded to produce a cross-like flute in the top face, as shown in Photo 6. Take care not to make the depth excessive as this tends to weaken the mill. The aim is to provide the mill with some centre clearance. The photograph shows a 4-tooth cutter but if the mill has more teeth, simply position the gashes to fall between the tooth. Beware not to touch the edges of the cutter in the process. It now remains to provide a cutting clearance to the remaining flats. This is a combination of two angles. 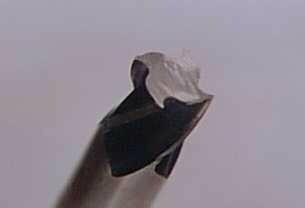 The first is along the front of the cutting edge, from the extreme tip of the tooth towards the centre of the mill. The second is more or less perpendicular to and receding from the cutting edge. I have found that a figure of around 5° gives a good result for both. I know that there is much more to this and the experts will prove me wrong, but it works well for me. Don't bother too much if the angle isn't quite right, but don't overdo it. 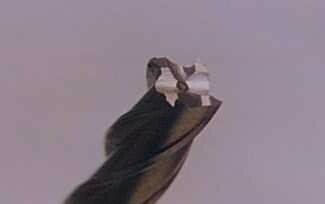 Too great an angle will weaken the cutting tips, to little will cause the cutter to rub and swarf jamming underneath. Don't grind too much from the extreme tips in this process, try to barely touch them. 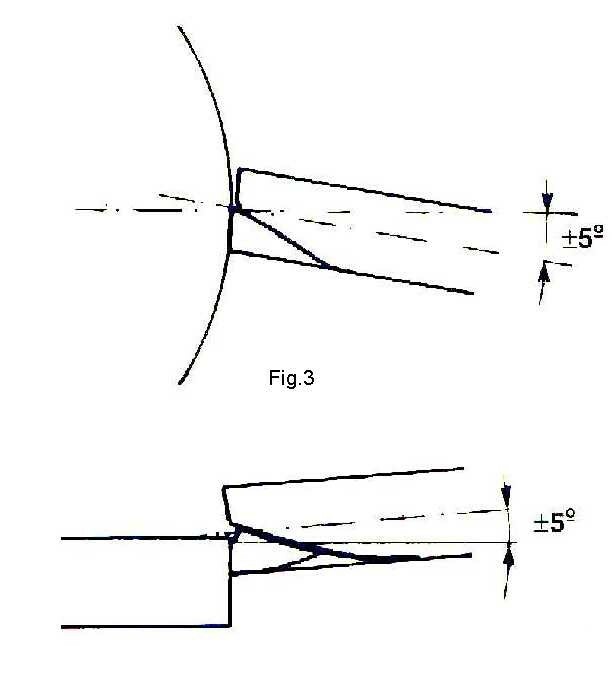 The technique for dealing with these angles using the sharp corners of the grinding wheel is shown in Photo 7. For the photograph I have exaggerated the angle a little to demonstrate the holding position. The position of the cutter is perhaps better explained in Figure 3. If the cutter is examined now, it will be noticed that it's starting to look like the real thing again. However at this stage the tooth tips are unlikely to be level with one another and the end mill will probably cut like a fly cutter. So in order to correct this rather odd situation on to the final step. Fit the cutter in the chuck of your milling machine or, if it is a small end mill, secure it in the chuck of your drilling machine and set it to run at a modest speed. Place an oilstone on the machine table and bring the cutter gently down until it barely grazes the stone as shown in Photo 8. Don't worry, I haven't yet had a cutter catch up, they're not intended for drilling this stuff anyway, and I did say "gently", didn't I ? Remove the cutter from the machine and carefully inspect the end face. It should show small flat surfaces at the extreme tips of the teeth. If you are lucky you will find four. Otherwise, if like me, you will probably have three or maybe only two. The objective now is to have another go at the grinder and take a bit more off the teeth that show these flats. And of course repeat the oilstone trick until all four of the teeth carry flat spots which should be uniform in size and as small as possible. It usually does not take that much time to get the result shown in Photo 9. 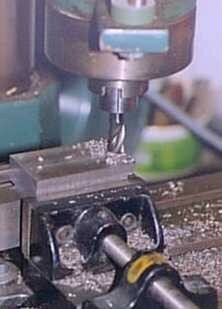 When fitted to the milling spindle, although a bit shorter, the cutter will perform almost as new, mine does, see Photo 10. 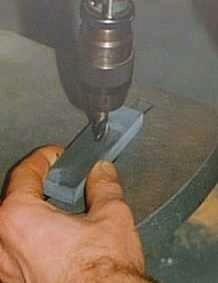 This method is hardly hi-tech and I have no doubt that regrinding on a proper tool and cutter grinder will be superior. Failing one of these, this way of dealing with blunt or broken mills has served me well over the years. I found out that it works equally well for the small, down to 3mm with magnifiers, as the larger multi-tooth ones. 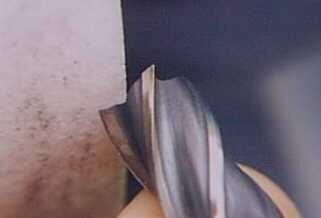 It is even possible to give those roughing end mills the same treatment. Whilst tackling one of these, be sure to make the centre cavity deep enough. These cutters tend to remove a lot of material and some of it will try to pass underneath the cutter, jamming and causing the cutter to wander around. Since this method of dealing with blunt end mills relies on the fact that at least part of the side of the mill is still intact I have developed the habit of restricting the dept of my cuts. Generally speaking 0.5 - 1 mm but with increase in feed ratio. So when a mill gets blunt I only have to remove a small part. Using this method I get more out of my end mills and most of them are resharpened this way until only the shank remains. 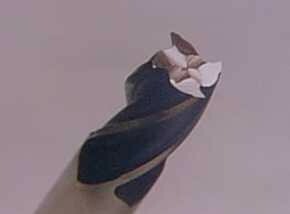 I know that sometimes there is no way round but using the side of the end mill. Also the mills resharpened this way lose the ability to drill. Well, being well tooled up I keep a few mills especially for this kind of work. I am pretty sure you keep a box, well out of sight, of one day useful blunt and broken end mills somewhere, get it out and have a go. You will be surprised with the result. This article is sourced from the article in Wilfried's Model Engineering web site and is used with permission. 81 Text and photos Copyright © 2006-2019 SMEX, All rights reserved.